Preheat the oven to 200°C, gas mark 6. Grease and flour a large baking sheet. Sift the flour, salt and baking powder into a large mixing bowl. Add the butter to the flour and rub in with your fingertips until the mixture resembles breadcrumbs. Mix in the mustard and 50g of the Cheddar. Coarsely grate the unpeeled apple into the bowl, discarding the core and any pips. Mix well to coat the apple in the flour. Gradually pour in the milk and mix with a knife to make a soft dough. Turn out onto a well-floured surface and roll out until about 2cm thick. Using a 4-5cm round cutter, stamp out about 12 rounds, re-rolling the dough if necessary. Place onto the baking sheet and sprinkle the tops with the remaining Cheddar. Bake for 15 minutes, until well risen and golden. Leave to cool on a wire rack. 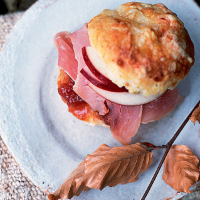 Serve warm or cold, split open and topped with Waitrose British Dry Cured Applewood Smoked Gammon Ham, a slice of apple, and a spoonful of Waitrose Apple And Walnut Chutney.